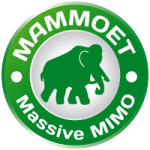 MAMMOET (Massive MIMO for Efficient Transmission) was the first major research project on Massive MIMO that was funded by the European Union. 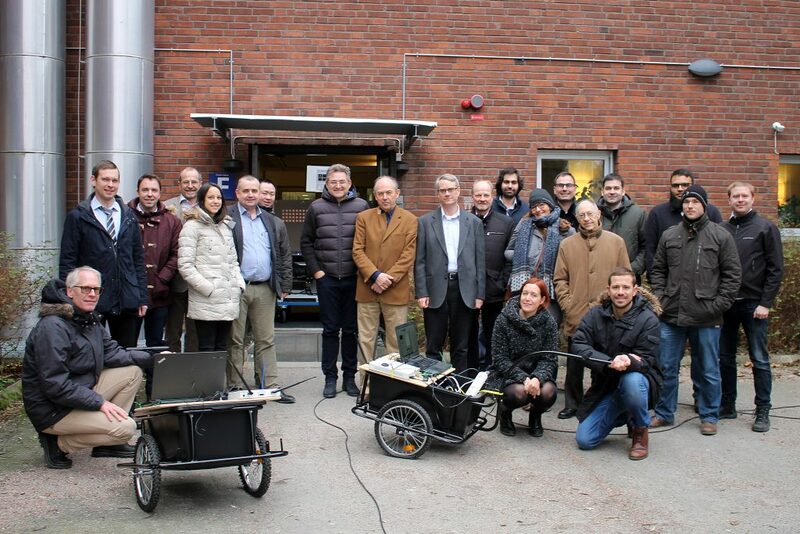 The project took place 2014-2016 and you might have heard about its outcomes in terms of the first demonstrations of real-time Massive MIMO that was carried out by the LuMaMi testbed at Lund University. The other partners in the project were Ericsson, Imec, Infineon, KU Leuven, Linköping University, Technikon, and Telefonica. MAMMOET was an excellent example of a collaborative project, where the telecom industry defined the system requirements and the other partners designed and evaluated new algorithms and hardware implementations to reach the requirements. This article is an interview with Prof. Liesbet Van der Perre who was the scientific leader of the project. 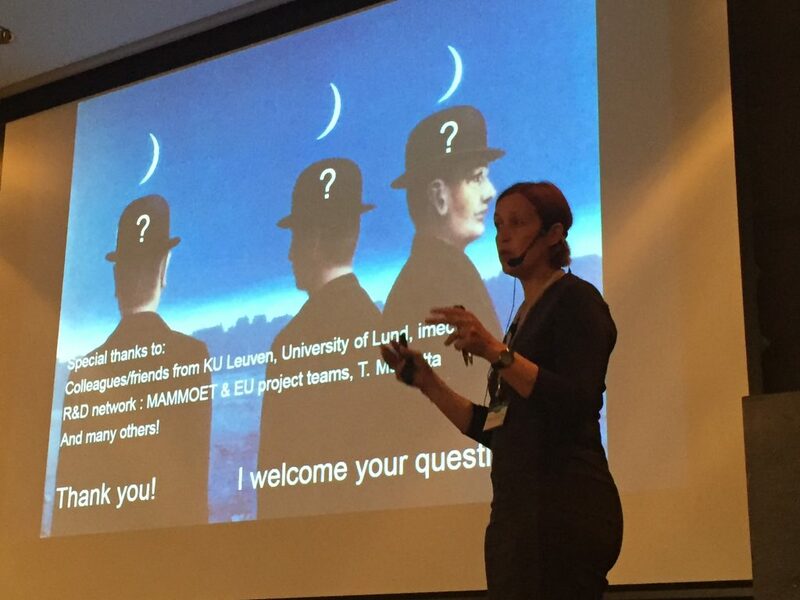 Liesbet Van der Perre while disseminating results from the MAMMOET project in September 2017. In 2012, when you began to draft the project proposal, Massive MIMO was not a popular topic. Why did you initiate the work? – Theoretically and conceptually it seemed so interesting that it would be a pity not to work on it. The main goal of the MAMMOET project was to make conceptual progress towards a spectrally and energy efficient system and to raise the confidence level by demonstrating a practical hardware implementation. We also wanted to make channel measurements to see if they would confirm what has been seen in theory. It seems the project partners had a clear vision from the beginning? – It was actually very easy to write this proposal because everyone was on the same wavelength and knew what we wanted to achieve. We were all eager to start the project and learn from each other. This is quite unique and explains why the project delivered much more than promised. The fact that the team got along very well has also laid the fundament for further research collaborations. What were the main outcomes of the project? – We learned a lot on how things change when going from small to large arrays. New channel models are required to capture the new behaviors. We are used to that high-precision hardware is needed, but all the sudden this is not true when drastically increasing the number of antennas. You can then use low-resolution hardware and simple processing, which is very different from conventional MIMO implementation. Some of the big conceptual differences in massive MIMO turned out to be easier to solve than expected, while some things were more problematic than foreseen. For example, it is difficult to connect all the signals together. You need to do part of the processing distributive to avoid this problem. Synchronization also turned out to be a bottleneck. If we would have known that from the start, we could have designed the testbed differently, but we thought that the channel estimation and MIMO processing would be the challenging part. What was the most rewarding aspect of leading this project? – The cross-fertilization of people was unique. We brought people with different background and expertise together in a room to identify the crucial problems in massive MIMO and find new solutions. For example, we realized early that interference will be a main problem and that zero-forcing processing is needed, although matched filtering was popular at the time. By carefully analyzing the zero-forcing complexity, we could show that it was almost negligible compared to other necessary processing and we later demonstrated zero-forcing in real-time at the testbed. This was surprising for many people who thought that massive MIMO would be impossible to implement since 8×8 MIMO systems are terribly complex, but many things can be simplified in massive MIMO. Looking back, it might seem that the outcomes were obvious, but these are things you don’t know until you have gone through the process. 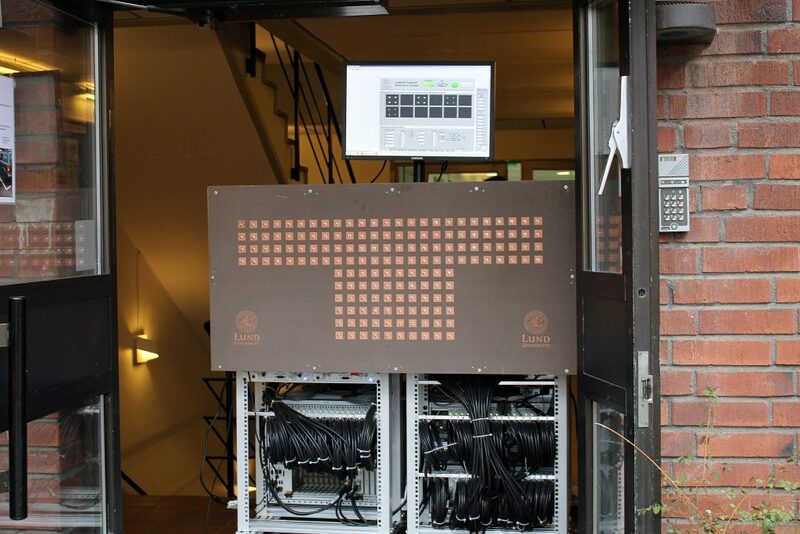 The real-time LuMaMi testbed at Lund University, the first one of its kind. What are the big challenges that remains? – An important challenge is how to integrate massive MIMO into a network. We assumed that there are many users and we can all give them the same time-frequency resources, but the channels and traffic are not always suitable for that. How should we decide which users to put together? We used an LTE-like frame structure, but it is important to design a frame structure that is well-suited for massive MIMO and real traffic. There are many tradeoffs and degrees-of-freedom when designing massive MIMO systems. Would you use the technology to provide very good cell coverage or to boost small-cell capacity? Instead of delivering fiber to homes, we could use massive MIMO with very many antennas for spatial multiplexing of fixed wireless connections. Alternatively, in a mobile situation, we might not multiplex so many users. Optimizing massive MIMO for different scenarios is something that remains. We made a lot of progress on the digital processing side in MAMMOET, while on the analog side we mainly came up with the specifications. We also did not work on the antenna design since, theoretically, it does not matter which antennas you use, but in practice it does. The research team of the MAMMOET project at the final review meeting of the project in February 2017. The deliverables contain a lot information related to use cases, requirements, channel modeling, signal processing algorithms, algorithmic implementation, and hardware implementation. Some of the results can found in the research literature, but far from everything. Note: The author of this article worked in the MAMMOET project, but did not take part in the drafting of the proposal. Previous PostMassive MIMO is Becoming a Marketing TermNext PostMassive MIMO for 5G: How Big Can it Get?